With two data centers now online in Canada, Canadian organizations have many new options for using cloud technologies from Microsoft. One of the features that was made newly available is Cloud PBX, providing call control in Office 365. Cloud PBX provides the call control for Skype for Business in Office 365 to allow organizations to make and receive PSTN calls from any endpoint that runs the Skype for Business client (noted exceptions currently not supported, VDI Plug-in, Lync Server Attendant, *PIN Auth). But there are multiple ways to access the PSTN network and this is the focus of our conversation today. If an organization wants to move as many services as possible to Office 365 then the natural choice would be to add PSTN Calling (only available in the U.S. at the time of writing) to Cloud PBX, where you can subscribe to domestic calling for $12/user/month which includes any +1 dialing, or international calling which includes domestic calling but adds international numbers for $24/user/month. I am often asked about who is providing the PSTN access for this service and the answer is Microsoft. The easiest way to understand this is that Microsoft has become a regulated carrier. Adding PSTN calling to Cloud PBX offers domestic calling of 3000 minutes per subscribed user which is pooled at the tenant level and the international subscription (which also includes domestic calling) offers 600 minutes, again pooled at the tenant level. Therefore, if you have 100 users in your organization and subscribe to international calling you will have 300,000 domestic minutes and 60,000 international for your organization. But, this is a service that is only currently available for users who subscribe to the service in the United States therefore available only for United States phone numbers. So what happens in Canada and other countries for that matter? Since Cloud PBX is the foundation to voice in Office 365, offering call control, we have the ability to built upon this service. Yes, we could subscribe to PSTN Calling but first, it is not available in Canada (yet) and second, what if an organization has a current contract with a carrier or carriers and it is cost prohibitive to get out of that contract? The good news is that you can integrate Skype for Business being delivered from Office 365 with your on premises carrier services by using Cloud PBX. Remember this service is offering call control in Office 365. From a high level the same integration options or rules apply as would if you were integrating current carrier services with Skype for Business deployed on premises. This means either using PRI’s, SIP Trunks or integration into existing PBX infrastructure, etc. 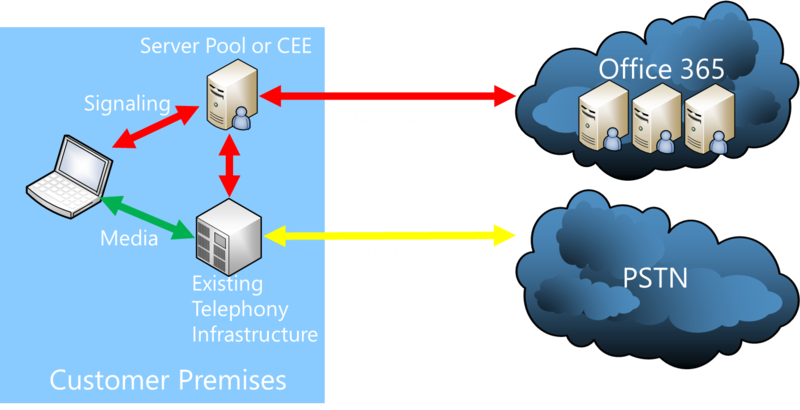 Some of you are thinking that you do not want to run the connection between Office 365 Cloud PBX and on premises PSTN with the unpredictable connectivity of the Internet. The good news is that you do not have to since Microsoft Express Route is available to allow private connectivity to Office 365 which will allow for extension of your existing network to Office 365. This is a lengthy topic of its own and topic for another conversation, but know that it is an option. When deploying Cloud PBX with on premises PSTN access, there is still a requirement for some infrastructure on premises. This can be done either with a deployment of Skype for Business or to minimize the on premises footprint, Microsoft’s new product Cloud Connector Edition (CCE). This product is the topic of another article but think of it as a minimized Skype for Business deployment within a single server, or servers if you wish to have redundancy. From the above diagram there are many options for the deployment on customer premises. Existing PSTN connectivity can be provided through existing telephony infrastructure, existing (or new) PSTN connectivity and do not forget about SIP. These are all supported solutions for Skype for Business today and continue to be supported solutions for use with Cloud PBX. We even have the same option to use multiple methods of PSTN access to provide many flexible options for end users to make and receive phone calls.